I happened across this recipe in the current issue of Food & Drink magazine (the free magazine you can pick up at the LCBO). I made a few changes from the original recipe: I used coconut flour instead of millet flour, I swapped lemon for orange and honey for pure maple syrup. Millet flour is gluten free, but much harder to find in regular grocery stores than coconut flour. This recipe can be baked as a cake, for 20 minutes at 325°F in a 10 inch round cake pan, or cupcakes for 18 minutes at 325°F. The cupcakes didn't rise a lot, but that makes them the perfect vessel for lots of icing! I used Chocolate Avocado Mousse for the icing, which is also gluten free. 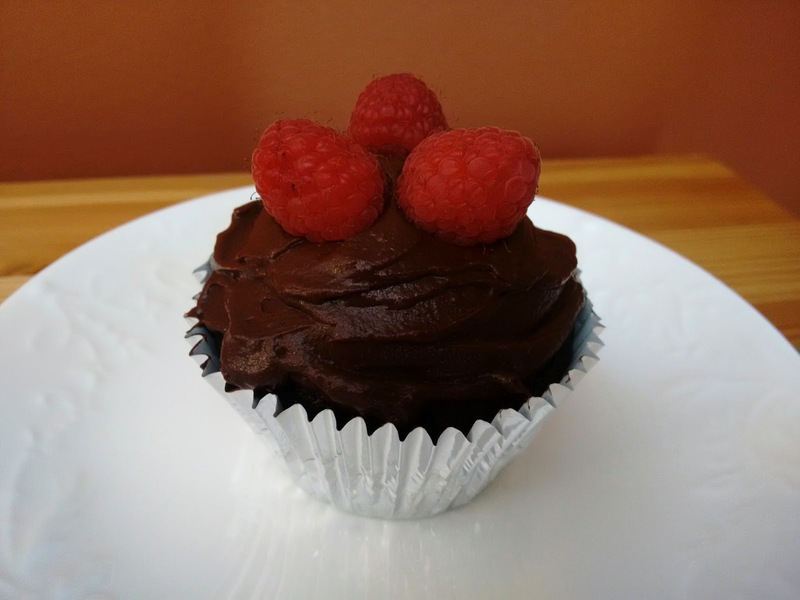 This cupcake and icing combo is lightly sweet and packed with flavour. 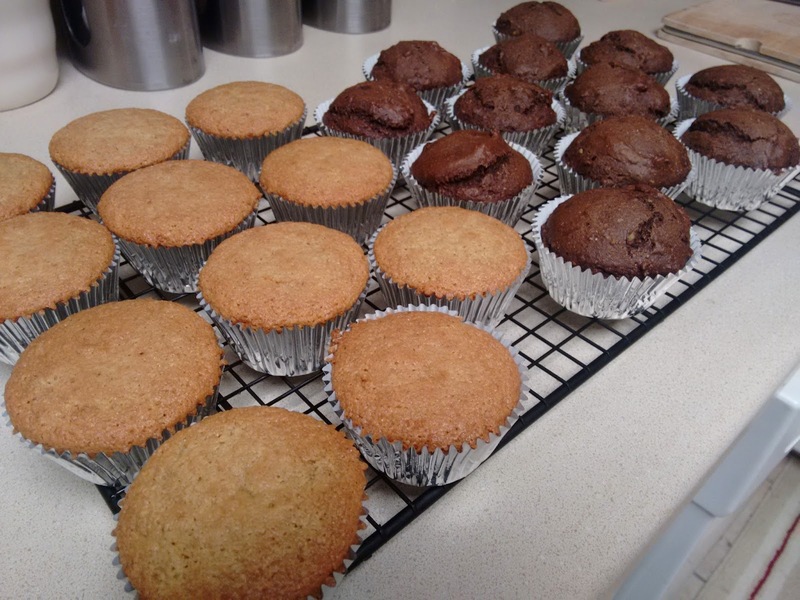 I made two dozen cupcakes for my boyfriend's birthday, and I expected that the Whole Wheat Chocolate Avocado Cupcakes would be preferred (I assumed everyone would go for chocolate! ), but the Almond Orange Cupcakes were voted the winner of the two! Preheat oven to 325°F. Line a muffin tin with cupcake liners. In a large bowl, combine almond flour, coconut flour, baking soda, baking powder and salt. Mix until uniform. In a medium bowl, add eggs and beat with a handmixer or with a whisk. Eggs should be light and frothy when complete. In a second medium bowl, combine maple syrup, coconut oil, orange zest and juice, and pour in half of beaten eggs. Whisk wet ingredients to combine. Pour wet ingredients into dry, then fold batter. Add the remaining eggs and fold in until uniform. Pour batter into 10 inch cake pan and spread evenly with a spatula. Bake for approximately 20 minutes, until cake is golden brown. Allow to cool in pan for 2-3 minutes. 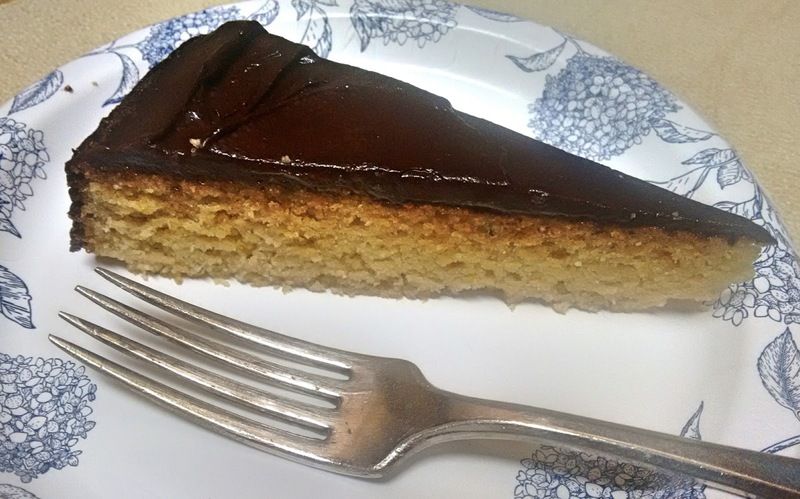 Run a paring knife between the cake and the pan to loosen from sides. Flip cake over onto cooling rack to remove from pan. Scoop batter into cupcake liners. Bake for approximately 18 minutes, until tops are firm. Allow to cool in pan for 5 minutes, then transfer to a cooling rack. Allow to cool fully before icing with mousse.